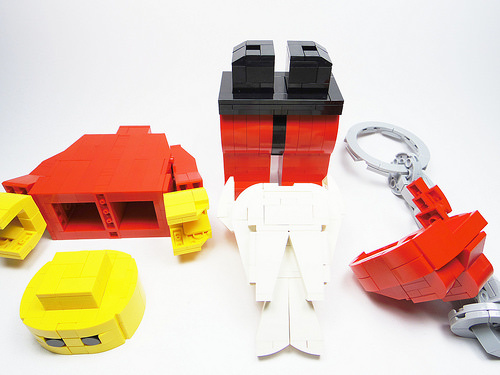 This time of year is one of the busiest for toy manufacturers, including the LEGO Group. In an effort to associate the brand with holiday gift-giving, the months of November and December bring a flurry of wintry-themed advertising. 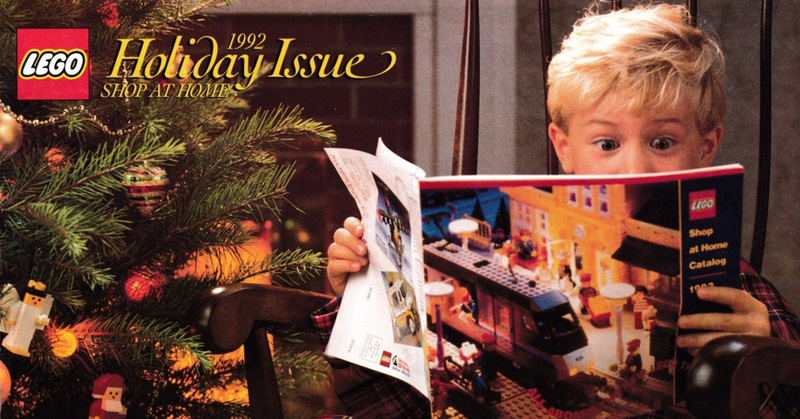 While much of the LEGO Group’s current advertising campaigns exist online, the company has a long history of producing holiday advertising in magazines, comic books, and mail order catalogs (aka LEGO Shop at Home catalogs). Our elves have been hard at work, sifting through the archives for some of the LEGO Group’s most memorable seasonal ads. Hop in the sleigh and hold tight for a wild ride back through time. Santa has been to the LEGO Store! We all know that Santa’s elves are good at what they do. 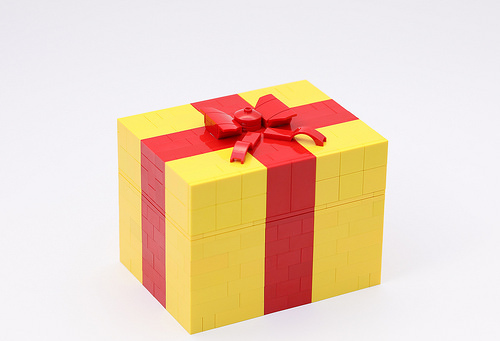 But when it comes to gifts for LEGO fans, sometimes you just have to leave it to the LEGO experts! 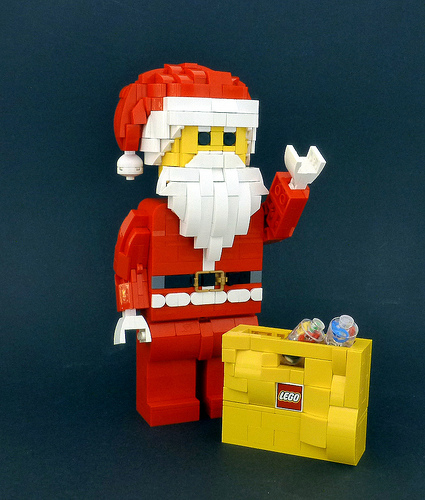 This lovely LEGO Santa, built by Brixe63, has decided to do a little shopping of his own. And what’s in the top of the bag? Pick-a-Brick cups, fresh off the giant wall at the back of the LEGO Store! There’s some nice parts usage to create the “cups” filled with colorful Technic rubber bands. 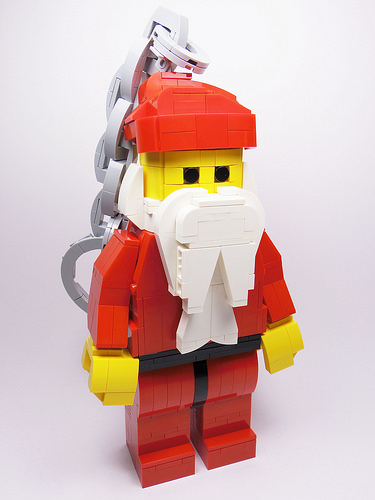 We also can’t forget the clever use of gold bucket handles to form Santa’s belt. 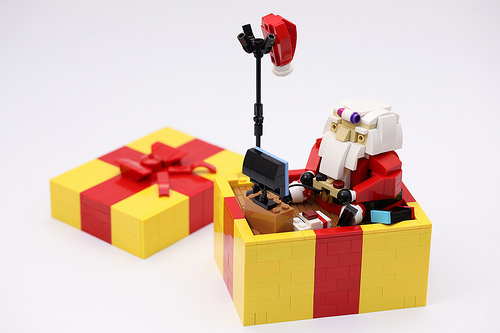 The Christmas gift box was one this year’s holiday giveaways from the LEGO Shop Online. Jae Won Lee has used the idea of placing a holiday scene in a present and taken it to the next level. The surrounding package looks lovely with its dark red paper finished off with a white and dark green ribbon. This is matched by a whimsical interior, depicting Santa making one of his many pit stops. The warmly lit fireplace, tree, and wreath are festive, and the scene itself is fun. The little girl hidden behind the tree is about to have a very nice Christmas, because Santa has brought her the Cafe Corner. 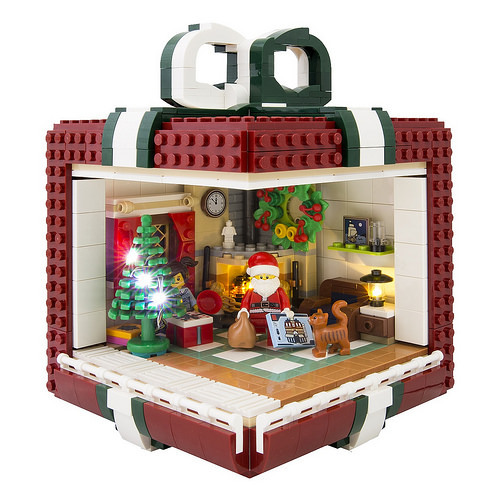 Who wouldn’t want the first set in LEGO’s modular building series under their tree? While the elves are busy making toys for girls and boys around the world, how does Santa spend his evening? For Taiwanese builder Joffre, the jolly old elf likes to hang up his hat and unwind with some retro gaming. Santa’s physical features are exaggerated so that he looks super stout and rotund. Joffre’s caricature is amusing and reminds me of the Santa from Tim Burton’s Nightmare Before Christmas. And is that a Nintendo Famicom he’s playing? It certainly looks the part! Santa’s game room can be converted into a giant holiday gift, complete with a slick-looking bow.